To make palm oil production sustainable, the future lies in increasing yields rather than expanding plantations, argues Australian scientist Lesley Potter. 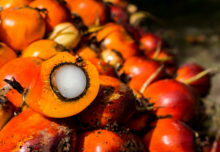 However, most governments of oil palm growing countries have ambitious plans to increase production over the next decades through expanding planted areas rather than intensifying production, Potter found in a recent review on Managing oil palm landscapes: A seven-country survey of the modern palm oil. 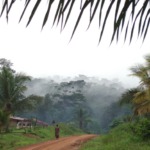 Favoring an expansive approach over intensification of production, bears the risk of further deforestation. Researchers from the Center for International Forestry (CIFOR) have described the expansion of oil palm as one of the main drivers of forest destruction in Malaysia and Indonesia with severe impacts on ecosystem services provision. “When planning out the future of oil palm, too little attention is given to yield improvements or alternative ways of proceeding, such as fairer ways of partnering between plantations and smallholders,” says Potter. Increasing crop yields – according to her – will depend to a large extent on smallholders, given the still large yield gap that exist between smallholder and industrial plantations. Potter’s review was carried out for the CGIAR Research Program on Forests, Trees and Agroforestry and covers seven countries that contribute significantly to palm oil supply globally. These are Indonesia, Malaysia, Colombia, Peru, Brazil, Nigeria and Cameroon. Australian national Lesley Potter is a Visiting Fellow in the Resources, Environment and Development Group at the Crawford School of Public Policy, ANU College of Asia and the Pacific at the Australian National University. She is a retired Associate Professor in Geography. 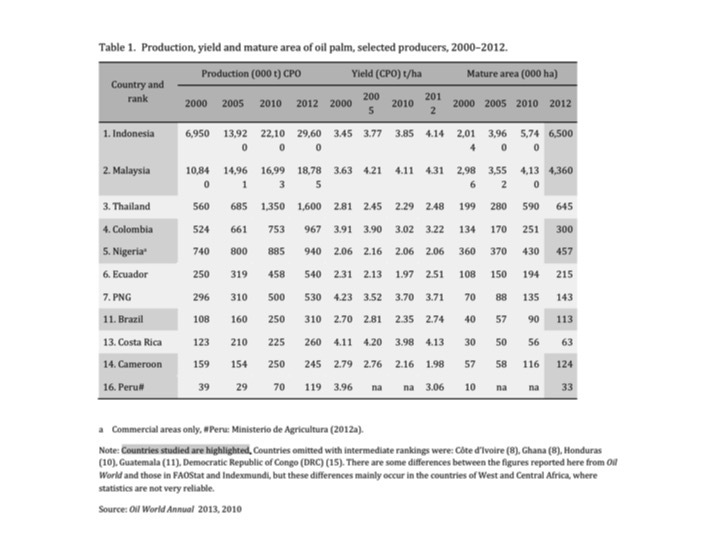 Below are some of her findings for oil palm development per country. In Indonesia, oil palm has been expanding rapidly, and poses important dilemmas for the government’s plans for development and climate change mitigation. The proposed production boost to 40 million tons of crude palm oil (CPO) by 2020 collides with the moratorium on peat swamps and the need to cut greenhouse gas (GHG) emissions by 26%. This leaves the big companies with the option to grow oil palm on degraded lands or on lands that have been licensed, but remain undeveloped. All provinces have large areas currently in ‘limbo’, says Potter, as land banks for the big companies or under undeveloped licenses. If those lands were to be taken up (and the original licenses cancelled), then that would release much suitable land. East Kalimantan is already going down that road and Central Kalimantan is thinking about it. According to Potter, “underperforming smallholders,” who could improve their yields if properly supported, present an important problem. 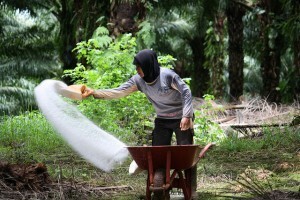 The Indonesian Sustainable Palm Oil (ISPO) Foundation is using the province of Riau, where smallholders have a considerable share in the total production, for trials linking independent smallholders to oil palm estates in order to assist them in improving their yields. “Often, independent smallholders struggle with poor seed, lack of fertilizer and simply ‘know how’,” Potter says. Supporting them could provide a huge increase in the supply of CPO if they succeeded in achieving higher yields. Potter argues that the growth potential of smallholders presents a huge opportunity for Indonesia, “but at present government and big companies rather perceive it as being a problem.” Private businesses have traditionally involved a portion of smallholders through different types of partnerships, yet more needs to be done to support independent farmers, adds CIFOR Principal Scientist Pablo Pacheco, who commissioned the review. In Potter’s opinion, a more inclusive approach would also help to reestablish trust between smallholders in their interactions with companies, and improve the poor international image that oil palm acquired as a “bad product”. She hopes that the upcoming inclusion of smallholders in the ISPO process will improve their situation. 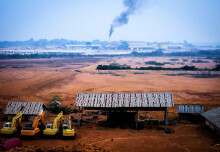 In Malaysia, the second biggest producer of CPO, the situation is different, as the country has almost exhausted its land resources, and more than two thirds of its agricultural land is already under oil palm. 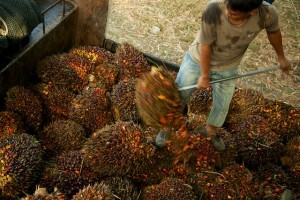 The palm oil sector is at the center of government plans to make Malaysia a high-income nation by 2020. Interestingly, government plans focus on promoting gains in productivity, especially on reducing yield gaps between high-performing plantations and smallholders, says Pacheco. But this is only one prong of its strategy. Malaysian agribusinesses, with some government involvement, have started to acquire lands abroad for expanding its supply base – for example in West Africa. In a complementary strategy, the government aims to involve large companies more in downstream activities, including processed foods, biodiesel and oleochemicals. pastureland that can be used to grow oil palm without having to cut down forests. Yet, expansion rates that were relatively high a decade ago have started to slow down, explains Pacheco. About half of the market for CPO in Colombia is domestic consumption of biodiesel. Different scenarios have been developed that include e.g. the expansion of an additional 930,000 ha for oil palm by 2020, half of which would replace current pasture areas. there are concerns about a possible expansion into vulnerable ecosystems, such as remnant dry forests in the north and the species-rich wetlands in the east, Potter states. “One should not forget that oil palm production in Colombia takes place against the backdrop of only just-resolved violent conflicts that impeded rural development for decades,” she says. For Peru, oil palm encroaching on forest areas, particularly in the Amazon, is a bigger concern, Potter warns. The situation in Peru is different from the other analyzed countries (except Colombia), as oil palm here is promoted as an alternative to coca production, which makes it more than an agricultural commodity. 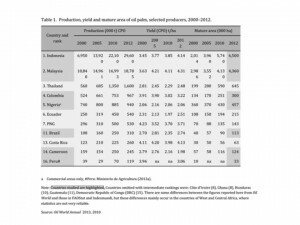 However, the total area planted with oil palm is relatively small when compared to other producing countries. Since 2000, the government sees the development of oil palm plantations as being in their national interest, for rural development and to meet national vegetable oil demand. For 2021, two different forecasts exist about oil palm expansion on the Amazon: A “controversial” study from 2009 sets the future cultivated area of oil palm at close to half a million ha, whereas the government is more conservative in its estimation of under 200,000 ha. In 2012, Peru had 33,000 ha under mature oil palm. The government has mapped around half a million ha suitable for oil palm in non-forested areas. So far, government policies have favored largeup corporations, Potter affirms. And although Free Prior and Informed Consent to development projects from local communities became compulsory in 2011, many applications for forest clearing are pending. For example a Singapore-based American who previously grew oil palm in Malaysia has has been offered 13 different concessions for oil palm in forested areas. 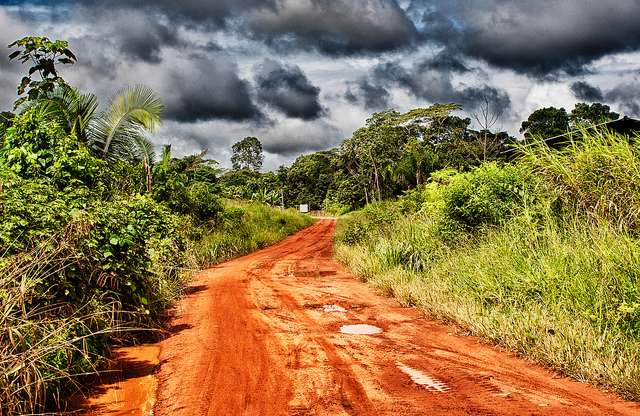 Brazil started promoting oil palm as biodiesel a decade ago and has a sustainable oil palm production program in place since 2010, under which around 30 million ha degraded and deforested land were identified for growing oil palm in parts of the Amazon. 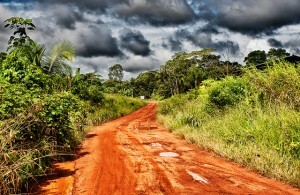 However, only some 4 million ha thereof will be developed, mostly in Pará, according to the government. In spite of the big plans for oil palm expansion, however, the actual development has been relatively slow, Pacheco adds. Once the biggest producer of oil palm, Nigeria today has to import crude palm oil, e.g. from Malaysia, to meet local demand. Nigerian CPO is more expensive to produce than Indonesian or Malaysian and is not competitive on global markets. The potential area available for oil palm is estimated at 24 million ha; only some 400,000 ha of those are made up by plantations. Although the predominant traditional oil palm groves with integrated farming and agroforestry are less environmentally damaging than plantation monoculture, the downside is their low yield. Plants are old and weather patterns less than ideal, explains Potter. A further obstacle in the way of oil palm development is weak land tenure: only 3% of the land in Nigeria is registered and mapped and the current system of placing all land under the control of individual states opens it up to the risk of graft and elites capturing that land. Although politicians and big companies regularly speak out for oil palm development, no specific, time-bound strategy seems yet to be in place. The former president’s ‘agricultural transformation’ agenda seemed to aim at moving as quickly as possible to a position of sufficiency and then begin to export, which Potter sees as “too optimistic”, given the circumstances. Cameroon is closer to meeting its palm oil demand through local production than Nigeria, but overall yields are still low and perhaps even falling. It is therefore likely that any increase in production will come from an expansion of terrain rather than from improved yields. The agriculture ministry forecasts 450,000 ha under oil palm by 2020. 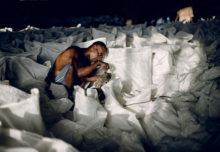 In 2009, the government announced its ambitious program to make Cameroon a middle-income country by 2035. In agriculture, the plan envisaged increased productivity through intensification and ‘the dominance of large and medium-scale undertakings’. 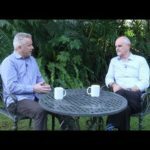 “Recent statistics don’t make that a very likely scenario for palm oil,” says Potter. This approach has also been criticized by local people.